I just posted a Bagel recipe the other day. My Sourdough Cinnamon Raisin Bagels. 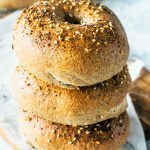 The thing is that I just found the most perfect bagel recipe! I didn’t really find it, more like I conquered it, after so many attempts over the years. It’s not that I was making awful bagels. They just weren’t perfect. Or up to my standards. Because I nailed it this time! You can check out some tips about making homemade bagels on my Cinnamon Raisin Bagels post. 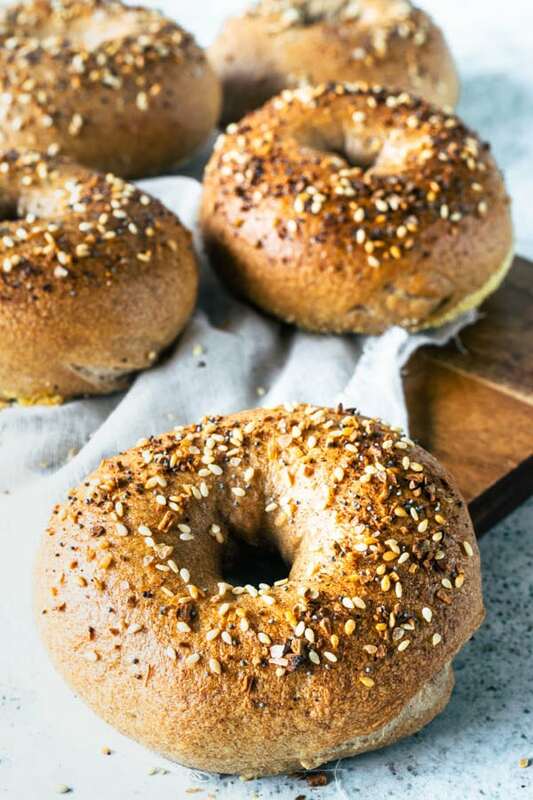 After I posted that recipe, I made these bagels again, in the savory version. We enjoyed them in sandwiches, and mainly avocado toasts. 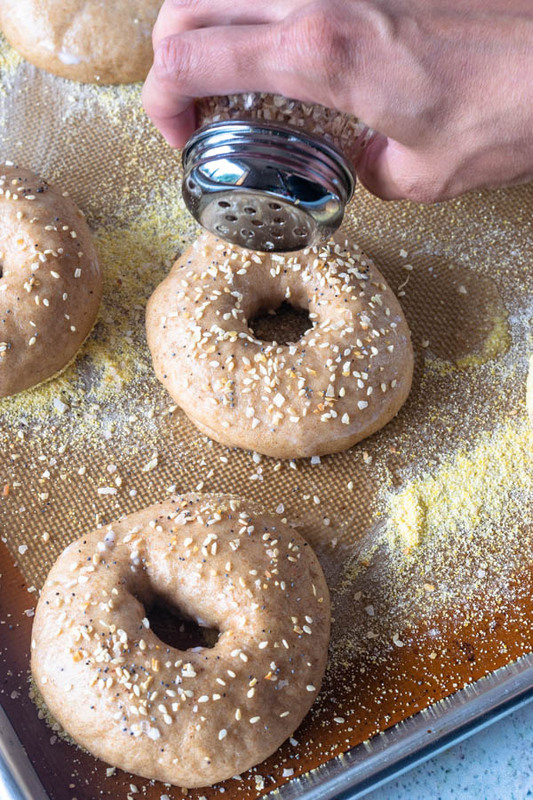 Making homemade bagels is a work of love, specially sourdough bagels. 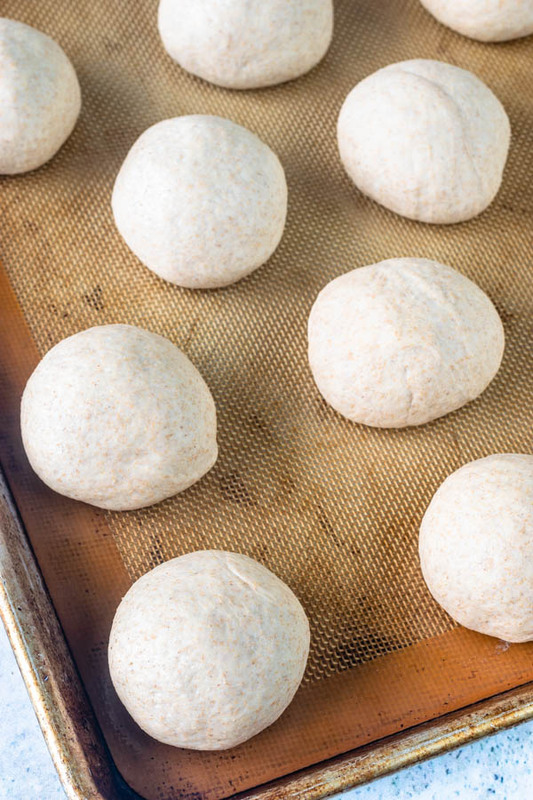 Shape your dough into perfectly round balls. To shape the bagels, simply cut a hole in the middle of the bagels with your thumb. Stretch the hole gently, as you roll the bagel around in your hands, making sure to stretch the dough evenly on all sides. After letting the shaped bagels rise, brush it with milk. Sprinkle bagels with seasoning. And you’re ready to bake. About the Everything Bagel Seasoning, I just used a bunch of stuff I had in my pantry. And you should do the same. 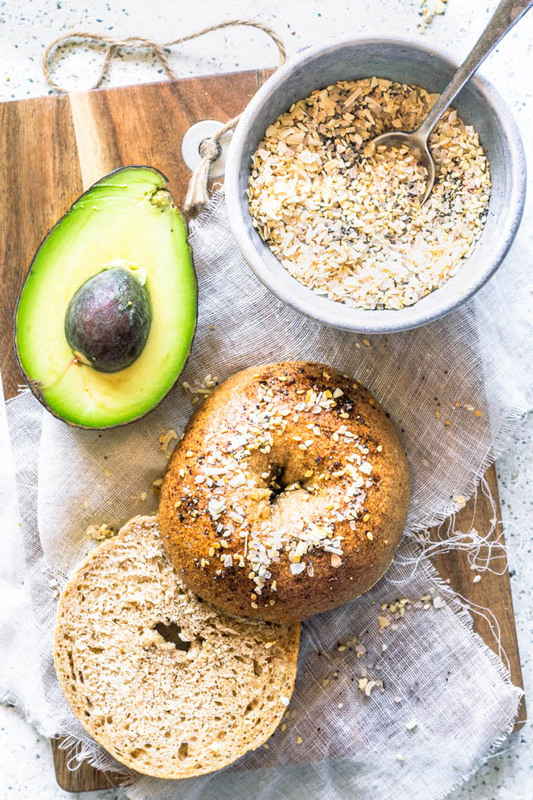 Don’t be strict and limited, you can add any and everything to your bagel seasoning. I used sesame seeds, poppy seeds, dried onions, dried garlic, coarse sea salt, and even some Za’atar I had in my spice cupboard. Za’atar is a tangy spice blend you will love, once you try it. So, these bagels were super delicious! 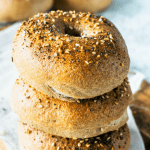 I hope you check out my recipes, and once again, my tips for making the perfect bagels can be found right on this post. Check out that perfect crumb!! And these bagels kept really well for a couple of days, actually. Bagels tend to get hard and tough after a day or so, however, on the third day, I had a bagel sandwich and they were still awesome!! Remember you can also freeze the bagels, split or whole, in a zip loc bag for up to 2 months. If you freeze the bagels cut in half, all you have to do when it’s bagel time, is to just pop these in the toaster, and that’s it. It will feel like you just went to the best bakery in town and grabbed some fresh bagels for breakfast! If you like baking with sourdough, here are some other recipes you can check out. Sourdough Everything Bagels. They have a crusty outside, a soft and fluffy inside, as all bagels should. 300 grams sourdough starter 1 1/2 cups, 10.6 oz. Start by mixing the sourdough starter, 1 1/4 cup of water, vegetable oil, malt syrup, sea salt, and flours together in a bowl. Mixture will seem extremely stiff. That’s ok. Just make sure all the flour is getting hydrated. If necessary, pour that remaining 1/4 cup of water in, if you see too much dry flour that won’t incorporate into the dough. Cover bowl with a damp towel and let dough sit for 10 minutes. Kneading: I would recommend a stand mixer to knead this dough. Or a lot of elbow grease. Bagel dough should be kneaded at least 7 minutes by machine, probably double by hand. And it’s a very stiff dough, so it’s not the easiest to knead. It’s very important that you knead this dough properly, so the bagels will have their proper texture and gluten development. At the end of kneading, dough should be smooth, but still pretty stiff and dense. Transfer dough to a lightly oiled bowl. Let it rise in a warm place for about 4 hours. If your place is cold, let it rise 5 hours. Transfer dough to the counter. I split mine into 100 g (3.5 oz.) pieces, and ended up with 14 pieces. Turn pieces into balls by rolling them against the counter, with your hand in a cup shape. Use the counter to push the dough against itself and turn into a perfect round. There are plenty of videos on youtube that show this technique properly. Very easy, and you’ll always end up with perfectly shaped rolls, bagels. Now that you’ve rolled all the pieces into balls, start by making a hole in the center of each ball with your finger. 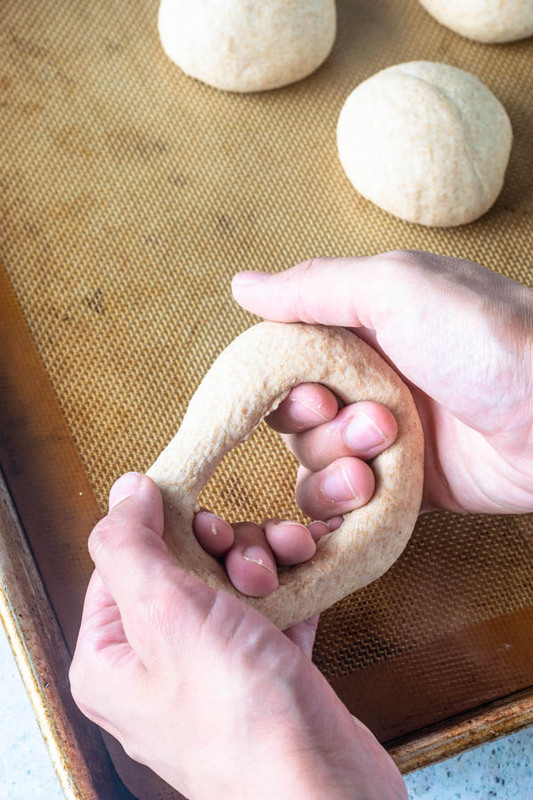 Expand the center out with your hands, by rotating the bagel as you shape the hole in the middle. Check pics above to see how I did it. Then, place bagels in 2 baking mat or parchment paper lined baking sheets. I put 7 bagels in each baking sheet. Cover both trays with a damp towel. Let them sit at room temperature for 1-2 hours. 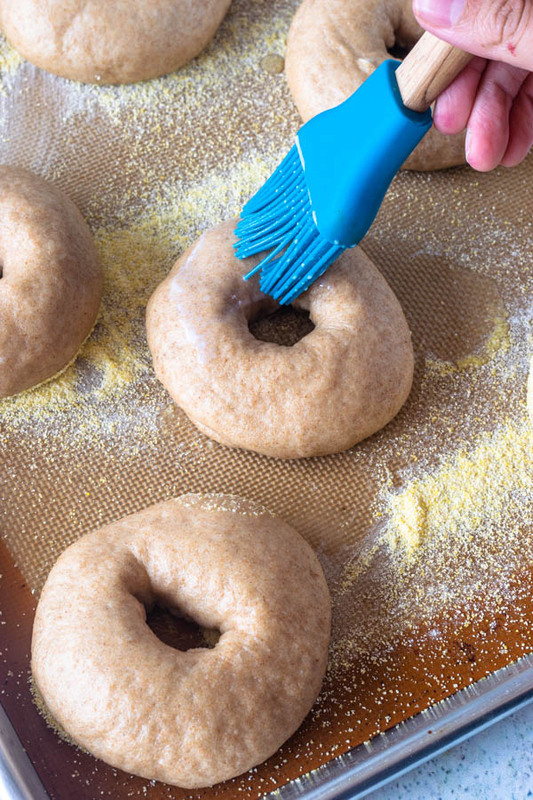 Once the dough is springing back as you touch it, means your bagels are ready to go. Once water comes to a boil, add baking soda to the pot. Boil bagels in batches, being careful not to overcrowd the pan. 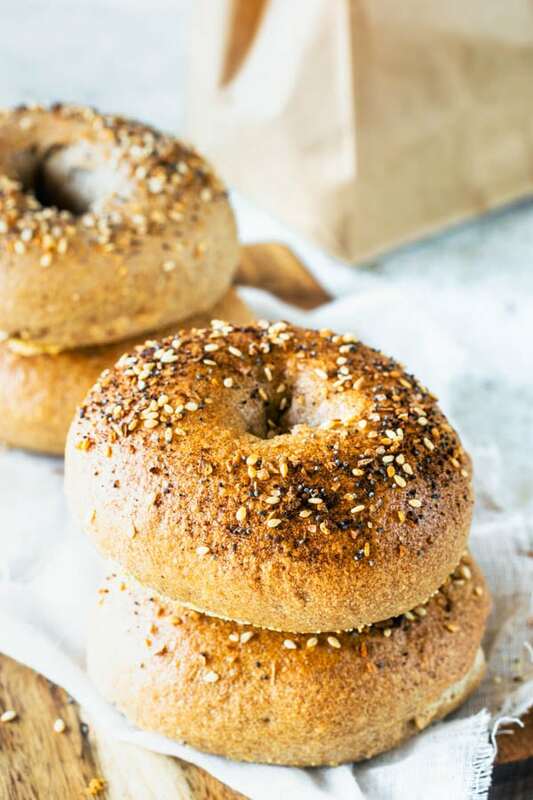 You should boil bagels about 20 seconds on each side. I don’t like to boil them over 1 min total, or their crust might turn out too hard. Remove bagels with a slotted spoon after they have boiled about 20 seconds on each side. Place boiled bagels in a baking sheet, lined with parchment paper or a silicon mat, and sprinkled with semolina/cornmeal, if you’d like. Sprinkle with whatever seasoning of your preference. I used a combination similar to Everything Bagel Seasoning. I used sesame seeds, poppy seeds, dried onions, dried garlic, coarse sea salt, and even some Za’atar I had in my spice cupboard. Za’atar is a tangy spice blend you will love, once you try it. I made a big batch of this seasoning to keep on my cupboard. I just keep it in a shaker, and shake on top of toasts and other savory goodies. After sprinkling your bagels with the seasoning, place trays in the oven. Bake for about 10 minutes. Rotate pans. Bake for another 5-15 minutes. It will really depend on your oven and what size bagels you decided to make. Once bagels have a deep golden color, remove them from the oven. Let them cool and enjoy them fresh. STORAGE: I like to enjoy the bagels when they are very fresh. That’s when they are the best. However, nothing wrong with leftover bagel toast in the morning. Keep bagels in an air-tight container for up to a couple of days, I wouldn’t go longer than that. You can also freeze them wrapped in foil and inside of a ziplock bag or freezer container for up to 2 months. For variations: For other variations, check out this Sourdough Cinnamon Raisin Bagels. 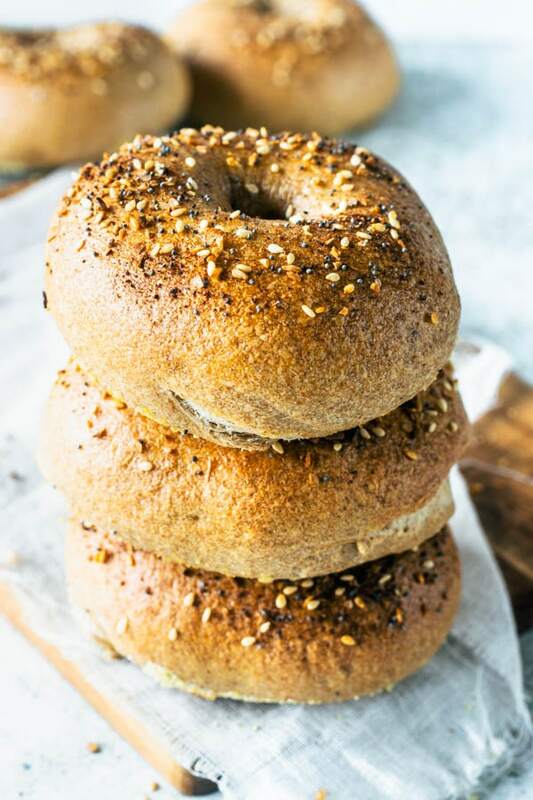 For bagel topping ideas: Seeds (Sesame, poppy, flax, sunflower, fennel), cheese (asiago is a big favorite), coarse salt, spice blends. I have no desire to make my own bagels anymore after making them every morning for years at my coffee shop! So you need to come make me these! I love sourdough!! Thanks Patrick! Id love to share these sourdough bagels with you! I ate so many of these bagels when I was in New York. I have to try making them myself. Yes you totally should. so much fun making bagels from scratch! I have never made bagels before, but if I’m ever going to do it, it will be these! Sourdough Everything sounds like the best flavor EVER! Thanks Allison! Yes it’s my favorite bagel flavor!! I sooooo wanna try these! Love sour dough and love bagels, this would be a perfect combo! Yes these are my favorite bagels. Thank you! Thank you so much!! I love making my own bagels!! Wow these bagels look PERFECT! Now I’m craving bagels! These bagels turned out just perfect! My husband said they were one of the best things he ate from sourdough, which is a big deal 😀 Thank you so much for the recipe, definitely making a double batch soon again. Thank you so much!! I am so happy you and your husband enjoyed the recipe!! I want to try this with my Sourdough starter, but my kids like blueberry bagels best. If you were to add blueberries, would you use fresh blueberries in the dough at the very end of the kneading process? I don’t want to crush all the blueberries too much. I’m looking forward to making these! 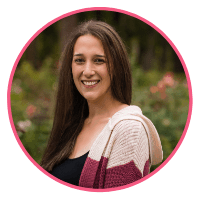 Hello Alicia, I would add them at the very end of the kneading if using fresh blueberries but chances are they will melt into the batter forming a swirl. If you want the blueberries to stay whole Id use some dried blueberries which happen to be delicious too!! Thank you for writing!! Have a great day!! Was my first attempt at making sourdough bagels – – have had good luck with sourdough bread making so far. These turned out great! Will be the new standard recipe in our household. I love the sound of these! Just the other day I asked my boyfriend to make bagels with me – he LOVES bagels. 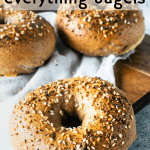 Everything bagels = HIS FAVORITE – So how fitting of me to have been browsing your recipes and bio. I used to make bagels all the time, but truthfully – never successfully made sourdough, Do you have a link or recipe for that ? I don’t know if I used to get thrown off by the measurements or if I was neglectful, but my sourdoughs never rose . Any help would be greatly appreciated. I’d love to try these!!! Thanks for your comment, have a lovely day!! !